So you want to get your company from Point A to Point B in its growth plan and you wonder what to do and how soon can you see the results. This blog explores the growth strategies and optimum ways of implementing them with the help of one or more business developers on your team. Your first growth efforts should be directed to putting a growth strategy. Without a growth strategy, your efforts will be directed to unknown ends or unexpected results that might not get you to Point B. 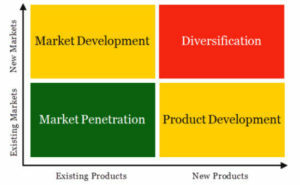 A smart product-market strategist would use a planning tool like “Ansoff Matrix” that depicts various strategies using the “products” and “markets” as dimensions. A smart business developer would also use Alternative Channels, Strategic Relationships, and Acquisition as part of the overall growth strategy. In choosing a growth strategy, it is important to start with a SWOT Analysis of your business. When you do the SWOT analysis by identifying Strengths, Weaknesses, Opportunities, and Threats, you should have great clarity on your strengths because “playing to your strengths” is often the best starting point. Then, a good look at the market, competitors, and opportunities around you will help you nail the best strategy to start and expand. There is no one way that is better. It often depends on the needs of our clients. Once a strategy is picked, we focus on implementing one strategy at a time in 3 months intervals. It is important to put extreme focus on the chosen strategy for this duration as the implementation involves taking several carefully chosen steps for its success. If we rank order Ansoff Matrix strategies in a complexity ladder using efforts, resources, and risks, at the lower steps of the ladder you will find intensive growth strategies starting off with less efforts, resources, uncertainty, and risk, and are easier to implement. Each new step up on the ladder brings more opportunities for faster growth, but also more uncertainty, efforts, and risks. This relationship is depicted in the Ansoff Matrix by movement along the axis from left to the right (products) and bottom to the top (markets/customers). Below you will find ways of implementing growth strategies starting from the lowest in the ladder. Simply sell more of your current products or service to your current customers – often a strategy perfected by large consumer goods companies. Examples of this are: offering six-pack of beverages, then a 12-pack, and then a large case. This is how many of us bring home a pack of toilet paper with 24-rolls. Find new ways for current customers to use current products. Examples are: turning your baking soda into a deodorizer for your customer’s refrigerator – another way of market penetration. Market penetration can also be achieved by expanding to new locations, through value sales, repackaging, etc. The problem for our clients in this strategy oftentimes is that it often does not grow products and customers fast enough to support the growth goals. When this happens, we often ask the question, is it that you need a new strategy, like product development or market development? This is the next step up the ladder. Devising ways to sell more of your current products to an adjacent market (e.g., offering your current products to customers in another city or state). This strategy is often adopted by fast-growth companies. The variations can include a tax service that began in one city expanded to start offices around the country via franchising, reach out to new markets internationally, entering fast growing markets like China and Brazil, promoting to a new target demographic (e.g., Coke Zero – first made for women, repackaged and advertised for men! ), reaching out to new customers using new distribution channels, online sales and using e-commerce to reach new markets. An example of successful execution of this strategy: Starbucks’s market development of its products (with minor localization) in China. An unsuccessful execution of this was Tesco’s attempt to enter the grocery market in the US where it misunderstood the needs of the US customers. It is also important to know why you are seeking a new market, is it for faster growth? With new market development, one cannot underestimate the power of marketing and advertising on top of the necessity to understand the needs of the new market and how your product meets those needs. This involves developing new products to sell to your existing customers. If you have a choice, you would ideally like to sell your new products to existing customers because it is less risky and it takes far less effort than having to learn about a new product and a new customer base – all at the same time, which can be extremely risky and challenging. Product development is the archetypical strategy used by mature companies with a built in brand name. For this reason, often times, product development plays the role of a natural ally of market penetration. Product development often involves heavy R&D and launch cost. An example of successful execution of a product development strategy is Dyson, which produced traditional vacuum cleaners launching its eye Robot vacuum. This involves growth through new products marketed to new customers. It lies way up at the top to the right in the complexity ladder. To a certain degree, diversification is almost like starting a new business as it is the strategy with the most risk and that requires the most resources to implement. As a result, diversification must be done with careful consideration and planning. At certain times, market conditions dictate creation of new products for new customers, after trying one or more other strategies or going directly to diversification as the growth strategy. When this happens, you want to be sure you know why you want to adopt this strategy and you should be deliberate on how you want to pursue it. Diversification often opens up an entirely new customer base for your new (and existing) products while creating new synergies between your current products and new customers – all desirable results. Permutations of this strategy include developing a new product to a younger customer base or to a customer base to which the product was not presented earlier. A good example of this is Apple introducing iPod (new product) in 2001 to digital music consumers – a new customer base different from its existing customer base (personal computer users). An example of successful implementation of diversification is the way Apple implemented diversification through a series of products that marked the introduction of the iPhone to an entirely new customer segment. While iPhone could be sold alone on its own, because of the way Apple implemented diversification, it helped them gain a new segment of customers (mobile phone users) for its personal computers. A careful examination of Apple’s gradual expansion of its product line reveals that it used all 4 strategies in Ansoff Matrix. The groundwork for launching iPod started with the release of iTunes in 2001, which was free software to organize and play digital music on Mac computers (penetration). Later in 2001 Apple released iPod, the mobile music player that allowed transfer of songs from the iTunes music collection to a mobile device (product development). Then, in 2003, iTune Store was launched allowing purchase of music online. All for Apple’s existing customers. In 2003, Apple introduced iPod to the Windows PC user base (market development). In the same year Apple enabled iPod to be sold to Windows PC users by releasing iTunes for Windows and giving iTunes software free to Windows PC users. iPod could not be used on its own by Windows PC users. However, the increased access to iTunes store by Windows PC users resulted in exploded sales of iPod and later iPhones. This is diversification at its best – building on the success of several products followed by introducing a completely new product to a completely new market. This strategy solidified Apple’s position as the market leader in mobile phones – a completely new product. A successful market penetration strategy often used by business developers is exploring new customers for new products through alternative channels. This involves pursuing customers in a different way or a medium (e.g., selling online, having physical locations, used distributorship, channel sales, or adopting a Saas model). Apple added its retail locations and Amazon adopted its Amazon lockers using one of these strategy. 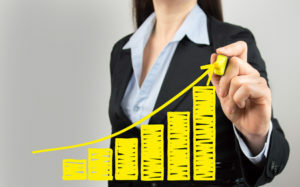 If you adopt one of the growth strategies above, you should ideally take only one step up the ladder at a given time, since each step brings more risk, uncertainty, and effort – unless of course market forces you to adopt a certain strategy as a means of self-preservation, or you have no choice but to take more risk. A good business development strategist can outline the details within a chosen strategy, goals, and actions for execution, which can be measured against the goals set. Such a plan will also include a strategy for creating long-term relationships that can result in strategic transactions that support a chosen strategy you have adopted in your growth plan. If you have exhausted all steps along the intensive growth strategies, the next set of strategies you can adopt for growth involves Acquisition or Integration. This topic will be covered in my next blog on Business Growth and Development Strategies: Acquisition or Integration. Shanika is a business development executive, startup advisor, and a technology lawyer with a vast network of connections that she uses to create revenue based strategic opportunities for her clients. Shanika can be contacted at 425-442-5797 or Shanika@teqlaa.com.